1. Blend all the ingredients together for about a minute. 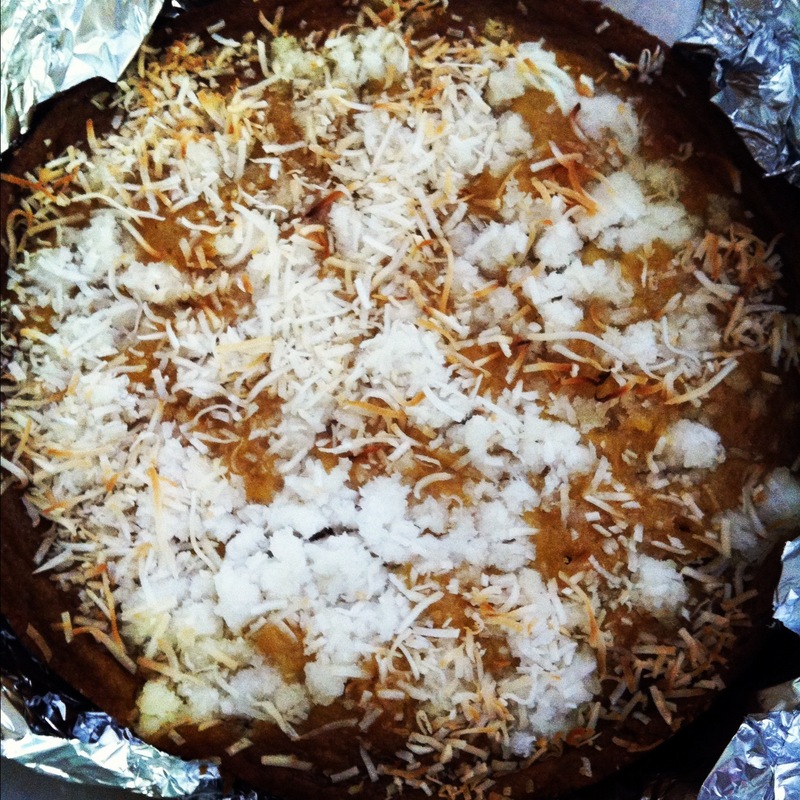 You just want a cake-texture but don’t need all of the coconut pieces to be ground completely. 2. 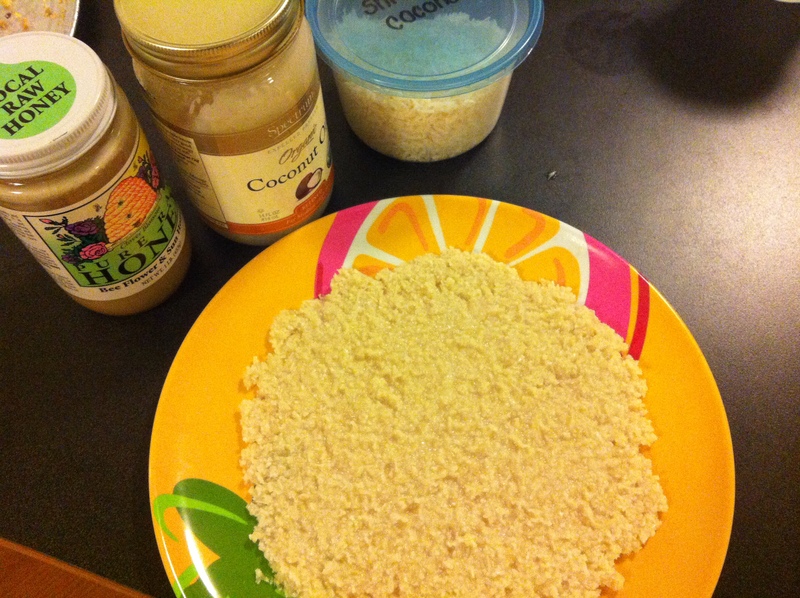 Mash the puree into a cake pan or onto a plate (like I did) and flatten out. Freeze for ~15 minutes and the cake is ready to eat! Store with some saran wrap around it either in the refrigerator or the freezer – it will last up to two weeks in the fridge! AH so many food recipes! Doesn’t it look delicious! Ah, definitely was. 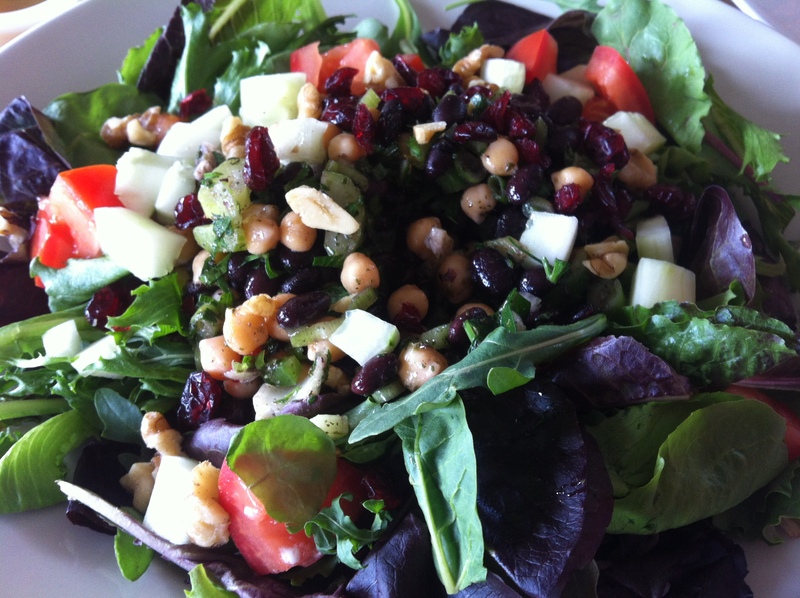 If you live anywhere near Bridgewater, NJ, I would highly recommend you go to Nuray’s and try something scrumptious out! 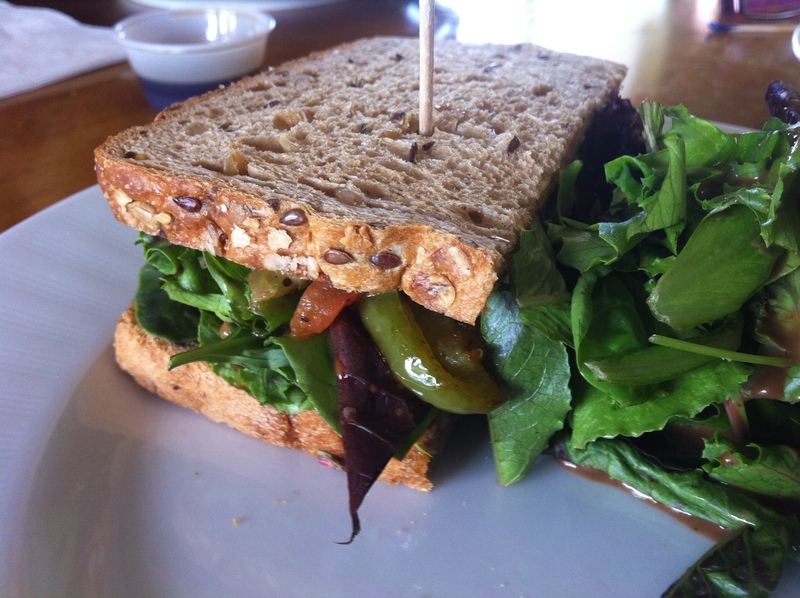 Speaking of scrumptious, my mom and I had an amazing food adventure day today. 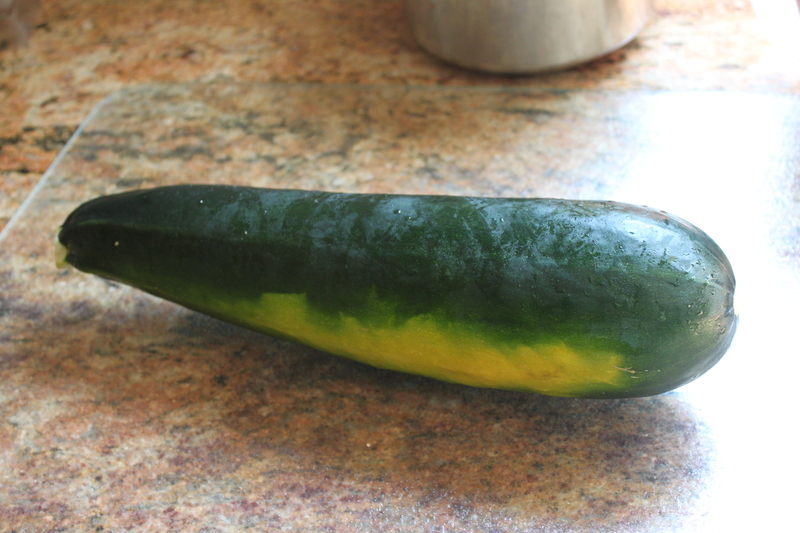 Her best friend has a vegetable garden and grew a delicious and gigantic zucchini so we decided to make two different types of zucchini bread. look how gigantic that is! Moreover, my mom taught me how to make one of my favorite Indian dishes: moong dal dhokla (Indian steamed cakes); and then taught me how to also make her favorite Indian dish: squash handvo (Indian spice cake). All so yummmmy, hope you enjoy like always! 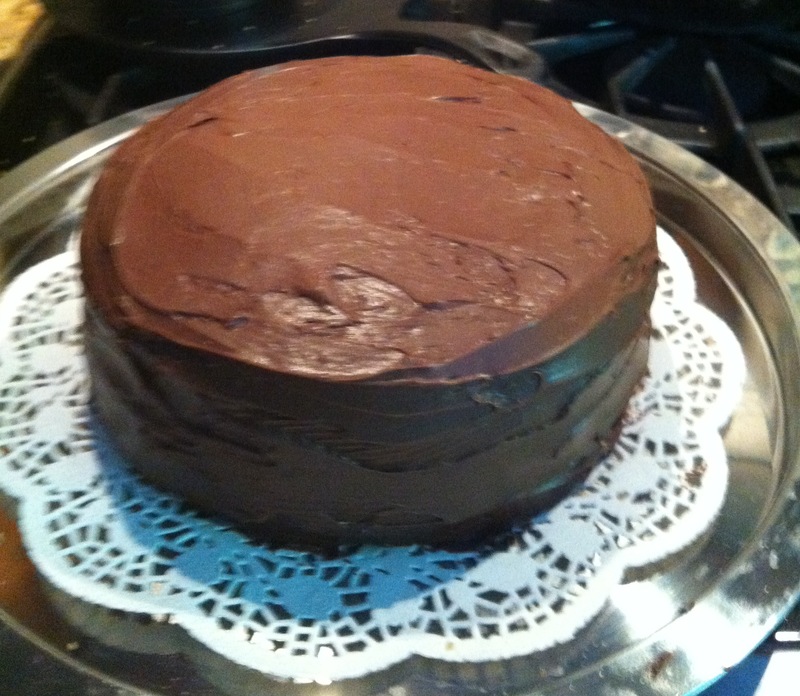 I tried my chances with making a double chocolate layer cake and it turned out to be delicious. So for my aunt’s birthday, I decided to make her a beautiful double layer vanilla cake. I gave the same directions with pictures as to how to make the cake, frost it, and decorate it on the recipe page for the double chocolate layer cake so click here for those. Enjoy! 2. 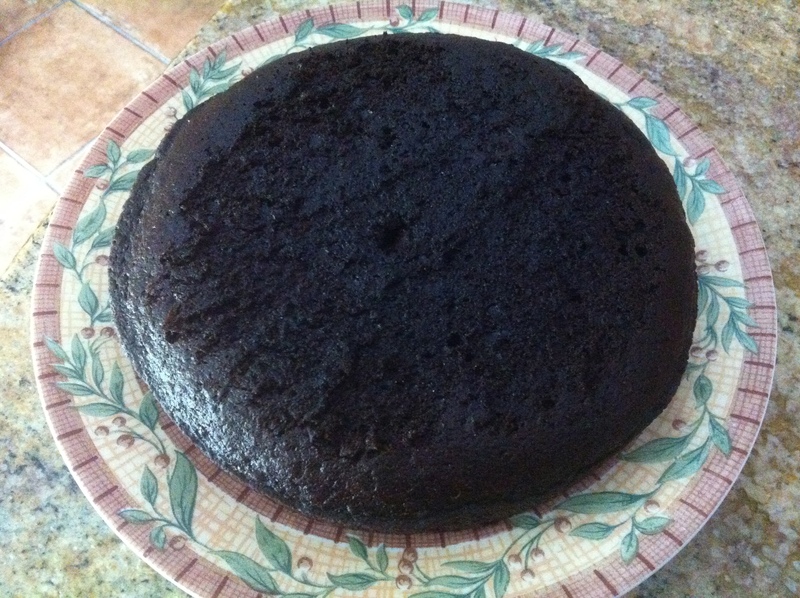 Grease two 9″ round layer cake tin pans and sprinkle a little flour around the pan or line the bottom with wax paper. 3. In one bowl, mix together the dry ingredients and in another, mix together the wet ingredients making sure that you beat the eggs properly. Pour the wet ingredients into the dry flour mix and stir altogether. 4. You can beat all of the ingredients together at a slow speed if you wish or use a spatula to stir till the batter is consistent. Scrape the edges properly as well to mix all of the flour. 5. 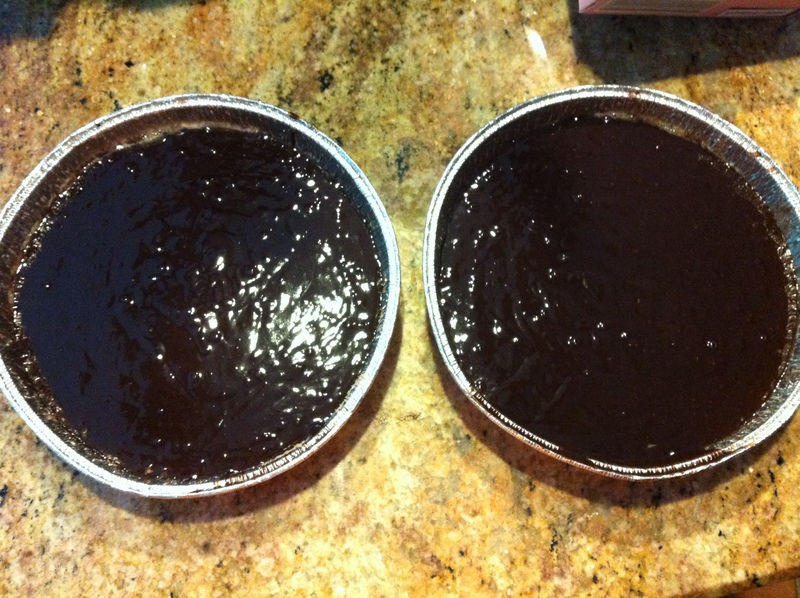 Pour the batter evenly between the two pans. Bake for ~ 40-50 minutes. 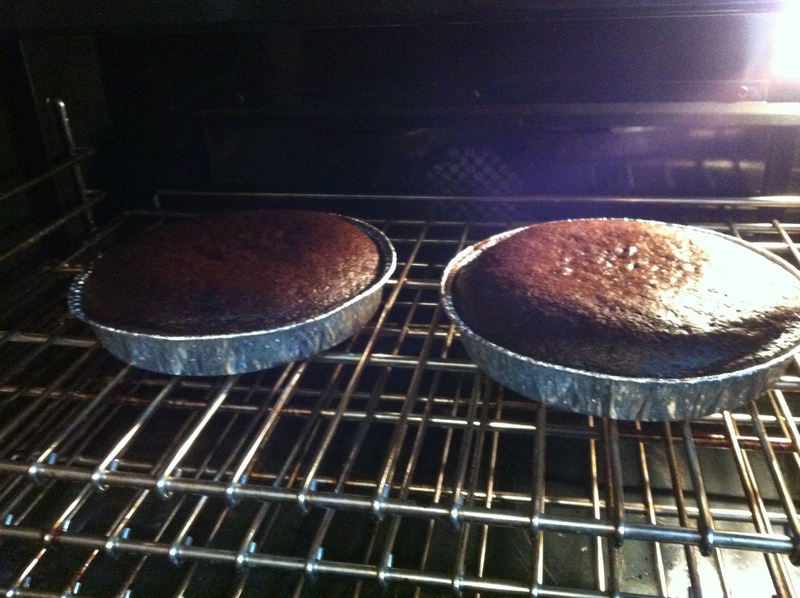 Place the two cake tins about 2 inches apart in your oven. You can check the cakes when you see that they have risen and the top of the cake is golden brown. Make sure that the cake is not sticking to the edge of your pan because you need to be able to carefully remove the layers without cracking them. Check if your cakes are done using a toothpick. 6. After the cake layers are down, remove them carefully from the pans and place them on a wire rack to cool. Be sure that the cakes are NOT cracking as that will hinder your ability to layer and frost them properly. 7. Wait till the cake layers have cooled. It took me about an hour to an hour and a half. If you don’t plan on frosting the cake the same day, wrap the layers in plastic wrap (saran wrap) tightly to ensure that the moisture is not gone and place them in your fridge. The layers will last about two days before you will have to frost them. 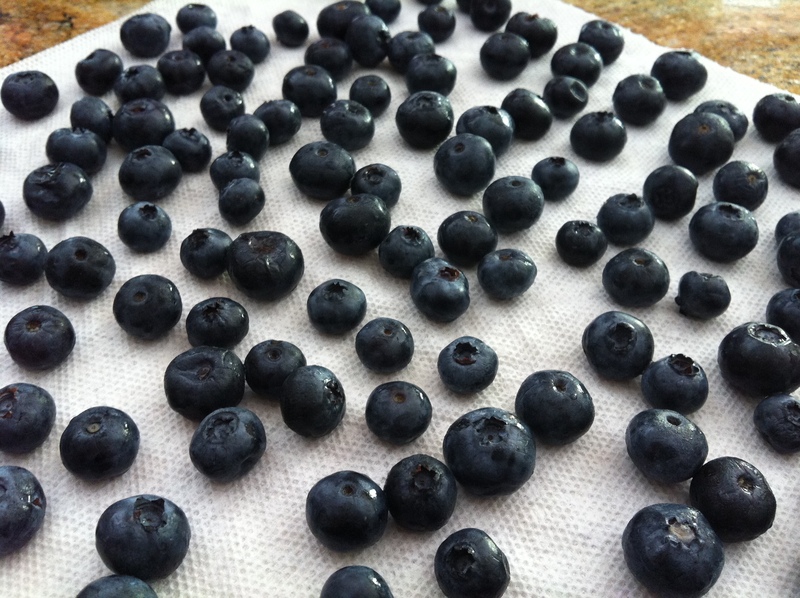 If you freeze them, take them out of the frozen about three hours before you plan to frost the cake. * Whenever you are planning to frost, be sure that your frosting is ready at room temperature so if it is in the refrigerator, be sure to remove it about an hour before you want to frost (I removed mine when the cakes finished so the frosting would be ready when the cakes cooled). * If your layers crack per chance, use some of the frosting once the layers are cool as glue and then put the layer(s) in the fridge to allow that frosting to harden. 8. 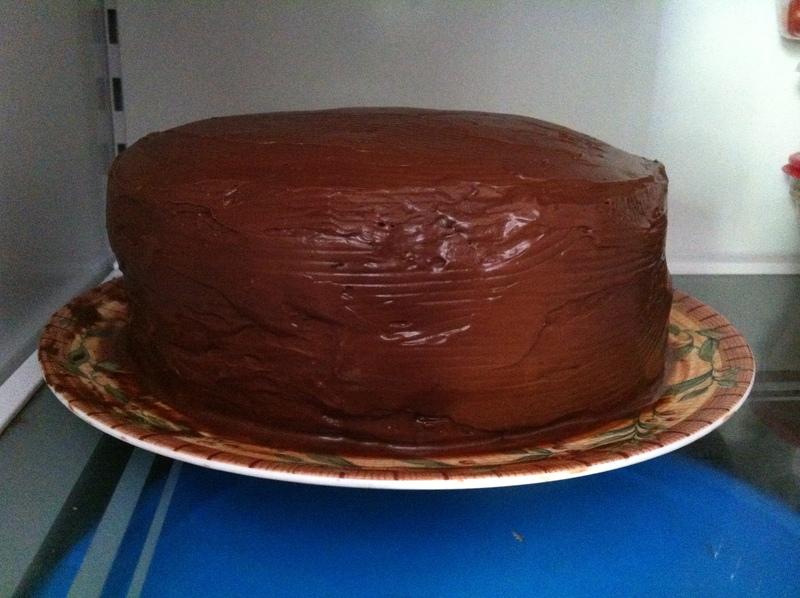 Once the layers are cooled and you are ready to frost, take a large knife and gently trim the top of the layers off. Since they are slightly risen, the cakes will not balance well on top of each other so you have cut off a little cake to make the layers flat. 9. Find you cake plate or the serving plate that you want to use for your cake (make sure it spins) and make sure it is clean. Take a dap of your frosting and place it in the center and take one layer and place the cut side right side up on top of the frosting. The frosting will basically act like a glue to hold down your whole cake. Slide little pieces of parchment paper to all sides of the cake if you wish to ensure that your cake plate does not get dirty when you start to decorate. 10. Using a utensil with flat edges that will be easy to spread the frosting, take a large lump of frosting and place it in the center of your first layer. Start to spread. Every time you reach for more frosting, take more than you think you need because you want to spread ONLY the frosting and not start to have such thin layers that you are pushing the cake around – this will lead to a crummy frosting layer. Also, make sure that you frost the edges of the cake properly – it’s ok if a little frosting hangs off the side because it will spread out when you frost both the layers together. 11. Once you have frosted the first layer, center the second layer with the cut side facing down on top of the first layer. Push a little but not too much to ensure it sticks. Once layered, frost the top of the second layer just like you did the first. 12. After both layers are frosting, start frosting the sides. In order to do this properly, you should do one section at a time, spinning your cake plate around to reach each section. If you try to spread the frosting around a large circumference area at one time, your frosting layer will become either too thin or crummy so do it in patches. Once you have frosted all the sides, you can even out the frosting so it looks more symmetrical. 13. Depending on how long it took you to frost and how hot it is, your frosting may start to get mussy and seem like it is falling. If you every hit that point, simply place the cake at whatever point you are at into the fridge for ten – fifteen minutes. This will allow the frosting to harden. 14. Once your frosting is at room temperature and not melting, you can start decorating. 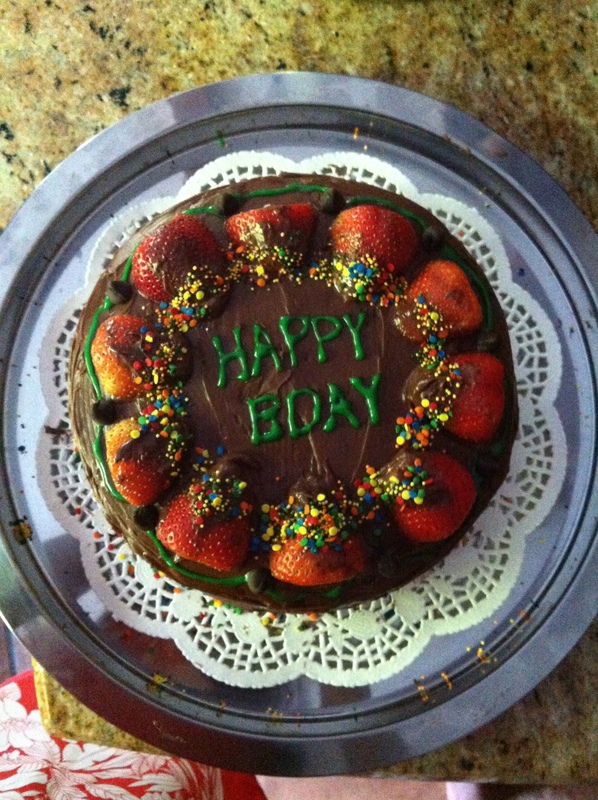 I used sprinkles and placed sliced strawberries around the cake. Then, I used sugar frosting and wrote “Happy Birthday”. Feel free to use your imagination! 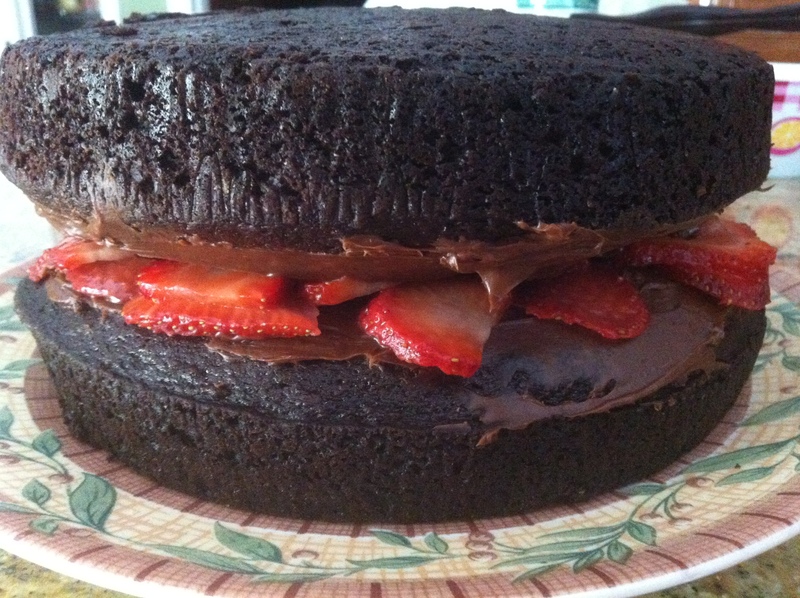 So for my little sister’s birthday, I decided to make her a beautiful double layer chocolate berry cake with chocolate frosting. 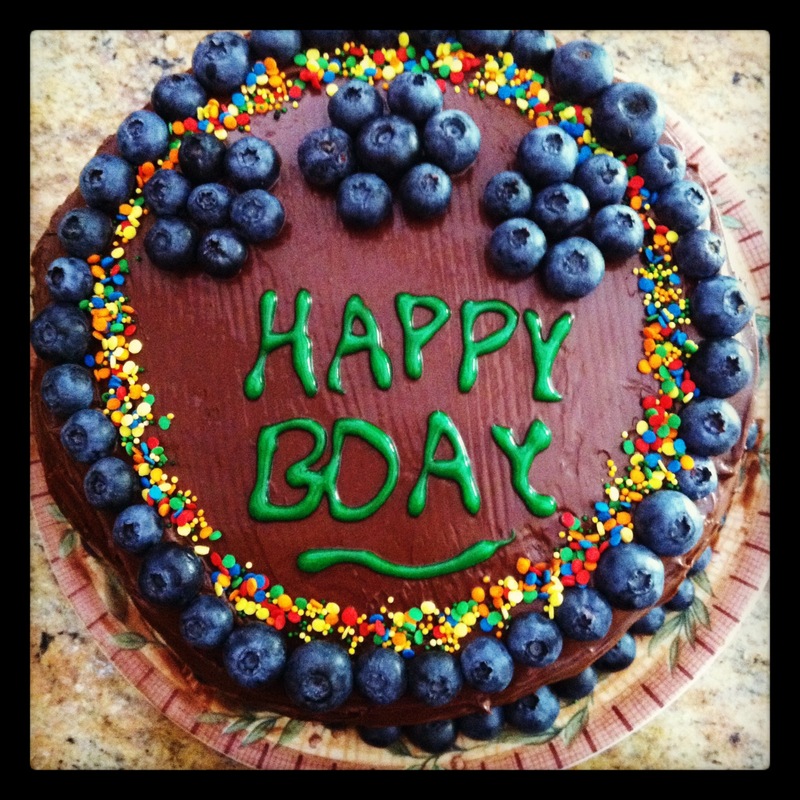 I always love to make cakes so I knew how to do that, but frosting and decorating was where I was a little dubious. I had interned at a bakery my senior year of high school so I had learned how to decorate cakes so I decided to give it a shot. It’s actually not as hard as I thought and hopefully, I can help you to make one as well! I also made a double layer vanilla cake so click here for that recipe. 5. 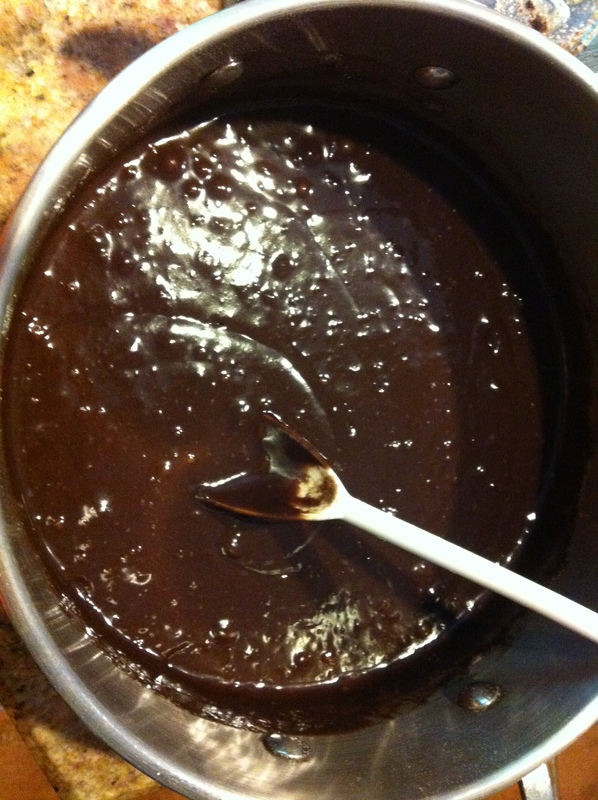 Pour the batter evenly between the two pans. Bake for ~ 40-50 minutes. You can check the cakes when you see that they have risen and the top of the cake is golden brown. Make sure that the cake is not sticking to the edge of your pan because you need to be able to carefully remove the layers without cracking them. Check if your cakes are done using a toothpick. 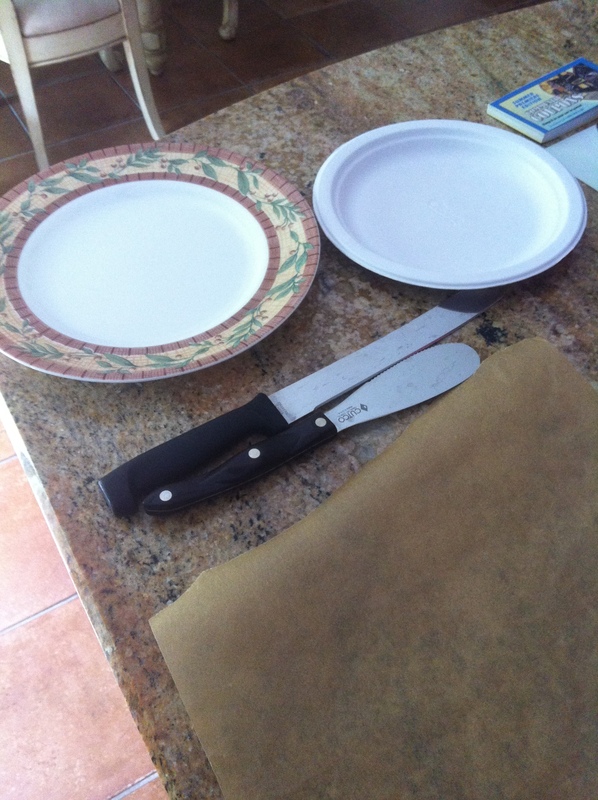 cake utensils: i used the plate to serve the cake since i didn’t need anything too fancy for my sister, the knife on the left is the one i used to cut the top layers of the cake, the spreading knife on the right was for the frosting, and the parchment paper is where i placed the cake layers to cut them. 9. Find you cake plate or the serving plate that you want to use for your cake (make sure it spins) and make sure it is clean. Take a dap of your frosting and place it in the center and take one layer and place the cut side right side up on top of the frosting. The frosting will basically act like a glue to hold down your whole cake. If you are worried about ruining your cake plate, slide little pieces of parchment paper to all sides of the cake if you wish to ensure that your cake plate does not get dirty when you start to decorate. 11. 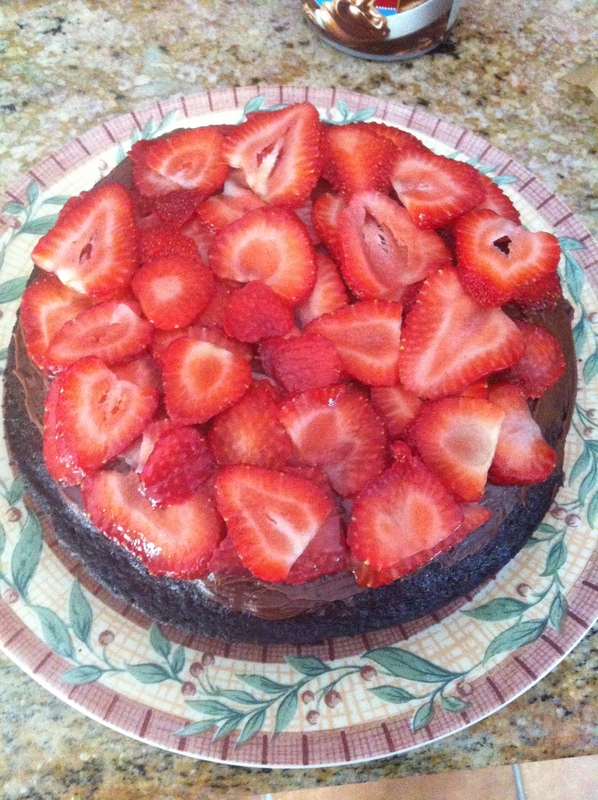 Once you have frosted the first layer halfway, take your thin slices of strawberries and place them everywhere. 12. Then, frost the second half of that layer on top of the strawberries. After you have finished frosting the first cake layer, center the second layer with the cut side facing down on top of the first layer. Push a little but not too much to ensure it sticks. Once layered, frost the top of the second layer just like you did the first. 13. After both layers are frosting, start frosting the sides. In order to do this properly, you should do one section at a time, spinning your cake plate around to reach each section. If you try to spread the frosting around a large circumference area at one time, your frosting layer will become either too thin or crummy so do it in patches. Once you have frosted all the sides, you can even out the frosting so it looks more symmetrical. 14. Depending on how long it took you to frost and how hot it is, your frosting may start to get mussy and seem like it is falling. 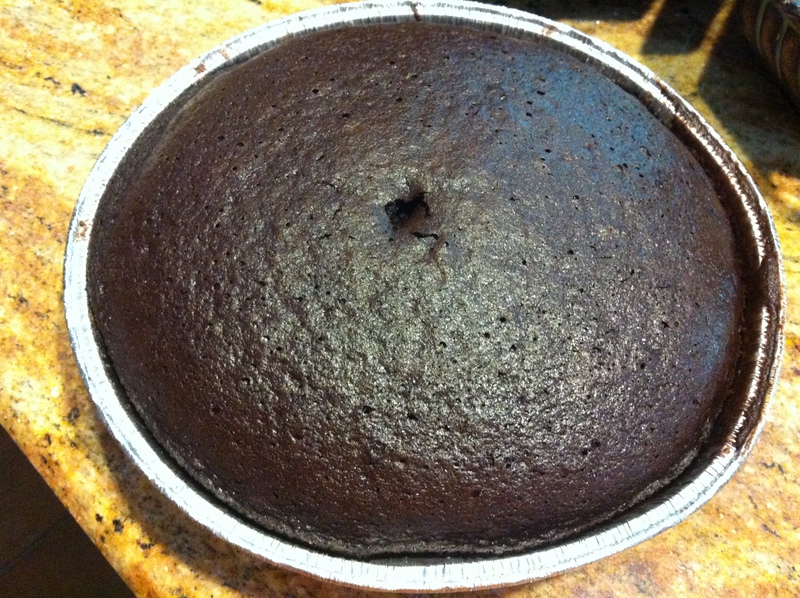 If you every hit that point, simply place the cake at whatever point you are at into the fridge for 10 – 15 minutes. This will allow the frosting to harden. 15. Once your frosting is at room temperature and not melting, you can start decorating. Feel free to use your imagination! 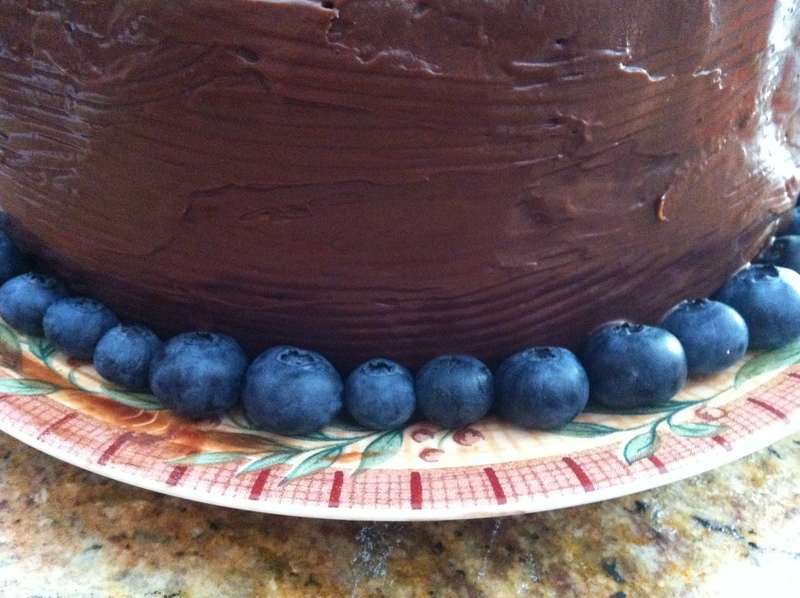 I used blueberries and confetti to decorate the cake. 1. If you are using fresh mangos, wash and peel two of them. Cut them into slices and blend them together to form a fresh mango puree. 2. Mix all the dry ingredients in a bowl – flour, salt, baking powder, and cinnamon powder. 3. In another bowl, mix the canola oil, vanilla essence, sugar, and mango puree together till the sugar seems to have mostly dissolved. 4. In the meantime, preheat the oven to 350 F.
5. Pour the wet ingredients into the dry ingredients bowl and mix well. 6. 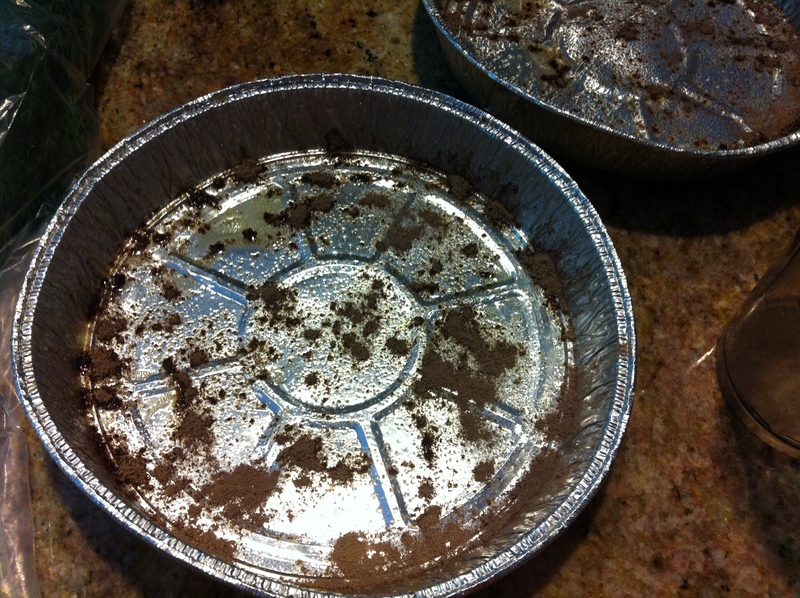 Pour the batter into a lined baking tin (either use PAM, vegan butter, oil, or a nonstick pan). 7. Bake for about 20-30 minutes, periodically checking to see if the cake has been completely cooked. When it is done, let the cake cool for ~30 minutes and then take the coconut flakes and sprinkle the entire top of the cake. Cut into desired slice sizes and serve! Weeks Worth of Vegan/Vegetarian Recipes! Raw Fennel Chickpea Salad w/ Brown Rice & 2 Ingredient Vegan Avocado Ice Cream! Raw Chocolate Peanut Banana Balls (Gluten-free, No Added Sugar, & Protein-Packed) <100 calories each!